To follow up my Capoeira Addict’s Ultimate Guide to Capoeira Books (and in response to Xixarro’s feedback), I’m going to give brief reviews of all the capoeira books I’ve read. (So keep this page marked, as I will be adding reviews as I read more capoeira books, as well!) To be honest, I’ve never felt comfortable writing reviews on anything, because how do I know whether it’s good or not, and who am I to tell other people, especially when reviews are usually done on such subjective works such as music, or literature? So just consider this a disclaimer that everything here is (obviously) my own personal opinion! This was the very first capoeira book I read, and I loved it…at least the first time around. As I’ve mentioned in a (much) earlier post, some parts of it felt like Nestor Capoeira had read my mind, especially when he talked about the beginner’s experience when first learning capoeira. This was also my first major introduction to capoeira history, capoeira myths and legends, and all the complexities and variations that they involved. It was engaging, interesting, and informative, and I thought it was a really good pick to have read as my very first capoeira book. Nestor Capoeira also uses a lot of long passages from others’ works (so much that I almost put it as a negative point), so you get some exposure to other well-known capoeira scholars as well. There were just a couple things that bugged me about the book, just a little at first and then became more pronounced as I read it more and the novelty of it being a capoeira book wore off. The first was that in certain turns of phrases or sentences, I thought Nestor Capoeira seemed to be pushing an ”agenda” or ”ideology” a bit too much to make the whole read completely enjoyable. I know I may be on thin ice saying this considering my own blog is angled, but it was just something that kept coming up through the book. The second thing I wasn’t crazy about, and this became more obvious when I started reading A Street-Smart Song, was the style of Nestor Capoeira’s writing when describing certain concepts. I don’t know if I or he wasn’t sure who the book’s target audience was, or if he was just trying really, really hard to be completely accessible to people with all education levels, but at several points I felt that the writing was almost…talking down to me, or gimmick-ifying (for lack of a better term) normal but just not often mentioned things. The one example off the top of my head is from Street-Smart Song (which I won’t review now because I’ve only gotten a few pages in), when he describes solar flares, ending the description with something to the effect of ”These are what are known as ‘solar flares”’ (with the quotation marks). Maybe it’s just my own neurosis on this one, but I didn’t really like the way outside examples were introduced like the water cycle is introduced to kindergarteners. Overall though, still a good read! Now this one, I really liked. I don’t actually quite know why I like it so much, but it seemed like the perfect all-around introduction to general capoeira history/philosophy/mythology to me, and without the bits of ”obvious agenda-soaked text” and over-simplified writing that irked me in Roots. The writing overall is much more polished, and the entire book is pretty well written. I liked pretty much everything in this book, but highlights included: a poetic description of the different stages of being a capoeirista, from beginner to mestre; a chapter made almost entirely of song lyrics and English translations (I liked to cover up the translations and test how well I could get the gist of the Portuguese first, and pick up some vocabulary along the way); and a really beautiful capoeira parable, an excerpt of which you can read here. This book was so cool!! Purely because I’m a nerd and really enjoyed seeing the words ”capoeira” and ”ginga” alongside other words like ”ethnographical” and ”Foucault”. XD Seriously speaking though, reading this book was a really good way to find out more about capoeira angola, since the author’s research consisted mainly of training (to a fairly high level) with GCAP. This book is an anthropological study of capoeira and how it changes us, physiologically as well as in all the other ways we (will) know and love so well. 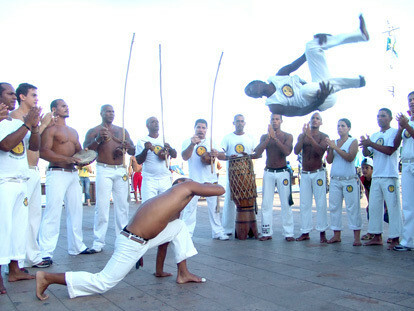 It talks about historical as well as modern-day capoeira, and brings in contemporary issues such as racism in Brazil, and capoeira’s role in it all. Learning Capoeira was the first academic capoeira book I read, and I would definitely recommend it to anyone! p.s. Thank you so much to everyone who commented on my last post! I haven’t had time to respond to them yet (because I want to do it properly), but I will as soon as possible. Just so you know, I’ve actually been travelling since the 16th and will be doing so until the 28th, but I will try my best to keep blogging as normal all the while!